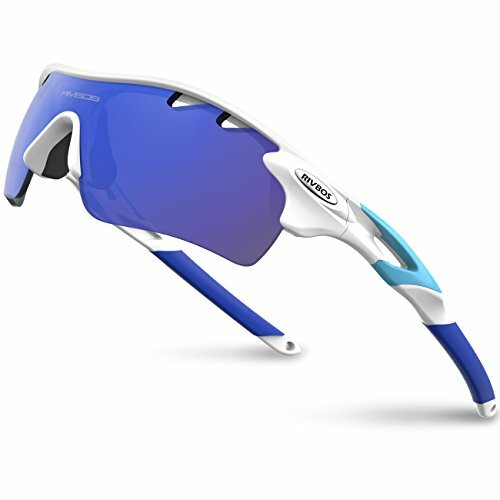 RIVBOS Sport Sunglasses Are Designed for Driving, Cycling and all Outdoor Activities. Lenses Made of Shatterproof Unbreakable PC Material are Durable Enough for Long Time Using. Only The Main Black Lenses are Polarized Lenses Against Strong Sunlight, the Other 4 Lenses are Colored Sunglasses for Different Environmental Condition. Come With an Elastic Sport Belt Which You can Exchange it When You Like it to be Strapped or Bow.? More Comfortable With Spare Rimmed Soft Rubber Pad. FIVE INTERCHANGEABLE LENS- Only The Main Black Lens are polarized. Restore true color, eliminate reflected light and scattered light, make the scenery more clear and soft and protect eyes perfectly. We provide five lens for you to exchange. One is the multi-color lens, the yellow one is for night activities,the blue one is for beach,the clear one is for windy weather, the black one is polarized for driving and other outdoor activities. HIGH-QUALITY PC LENS- Lens are made of high quality shatterproof PC material that is durable enough for long time using. They are suitable and interchangeable for any climate and weather conditions. And we have added UpGrade Patent Design for Switching lenses,it's easy to switch the lens now.